The Hickstown school site is now the Crest Street senior center. Walltown neighbors say the Walltown Rosenwald was located near what is St James today. Sebastian: There are "faux-Rosenwalds" scattered around. I did a survey several years ago on a former schoolhouse in South Carolina that I would have bet money on was a Rosenwald. At first, the "official Rosenwald preservation group" (can't remember their name) even thought it was one they never knew about; but, alas, it was built by the county and seemed to be modeled after the successful Rosenwald style. Gary: Thanks for yet another cool post... keep 'em coming! Interesting article in the Herald Sun about the fundraising effort going on to help fix up this school. I know less about Durham's Rosenwald Schools than I should, but I have to imagine that the Russell School on St. Mary's Road, is one of the better preserved/restored Rosenwald schools in the state of NC. "The school building program was one of the largest programs administered by the Rosenwald Fund. Using state-of-the-art architectural plans designed by professors at Tuskegee Institute, the Fund spent more than four million dollars to build 4,977 schools, 217 teachers' homes, and 163 shop buildings in 883 counties in 15 states, from Maryland to Texas. The Rosenwald Fund used a system of matching grants. Black communities raised more than $4.7 million to aid in construction. These schools became known as "Rosenwald Schools." By 1932, the facilities could accommodate one- third of all African-American children in Southern schools." In accordance with a tradition of black schools being associated with black churches, even if only by proximity, on July 2, 1927 Harvey Wilson donated a two-acre tract on the Hillsboro Road, on the west side of Cain’s Chapel Church (established in 1897), to the Durham County Board of Education.8 School supervisors selected Floor Plan 2-C for a two-teacher community school from the Rosenwald Fund’s 1924 catalogue of school plans. (See Fig. 1) The plan was designed to face north or south, with the long banks of classroom windows facing east and west, the optimal direction for natural lighting to minimize glare. Construction must have begun almost immediately on the frame two-classroom Rosenwald School, as it opened in 1927 or early 1928. Total construction cost was $3,695, of which the county school system contributed $2,725, local Negroes $270, and the Rosenwald Fund $700. Children from a five-to-six mile radius, extending south to Bivens Road and Umstead Road and north to the Little River, attended the school. Among the families whose children were educated at Russell School are the Allen, Atkins, Bowman, Bullock, Cameron, Craig, Clayton, Cooper, Crisp, Dunnegan, Edwards, Graham, Hedgspeth, Jenkins, Horton, Kenion, Kelly, Lewis, Lunsford, Mack, Moore, Mosby, Outing, Patterson, Pierce, Richards, Riley, Tapp, Tinnen, Trice, Turner, Umstead, Utley, Whitted, and Wilson families.11 Former students Pearl Mack Holman, Russell Mack, Peggy Mack, David Cooper, and Bessie Pearley still live in the community. They recall that families generally had ten to twelve children who worked with their parents on their farms, helping to raise corn, tobacco and other crops and cows and other livestock. The school year started in the fall after the tobacco was harvested and cured and continued until time to plant the spring crops. Russell alumni remember fondly their teachers and their school days. The school’s two teachers boarded in the community. Lillie Rogers taught at the school during its entire history, until it closed in 1945. In the early years she lived with the Cooper family. Teacher Bessie Vanhook boarded with the Mack family. In the early days, children walked or were driven to school by their parents. Since there were a number of sawmills in the area, dirt roads cut through the woods to carry out the timber provided short cuts for the children walking to school. By about 1940 a school bus delivered students to the school. In the early years grades one through seven attended the school. Grades one through three occupied one classroom; grades four through seven the other. The teachers enforced strict order in the classrooms, but recess was a joyful period of play not only on the playground in front of the school, but throughout the surrounding woods. In the early years students brought lunches, generally ham, preserves, and potatoes. During the early 1940s, the school had a cook who prepared lunch for the students in the industrial room (kitchen) that adjoins both classrooms. 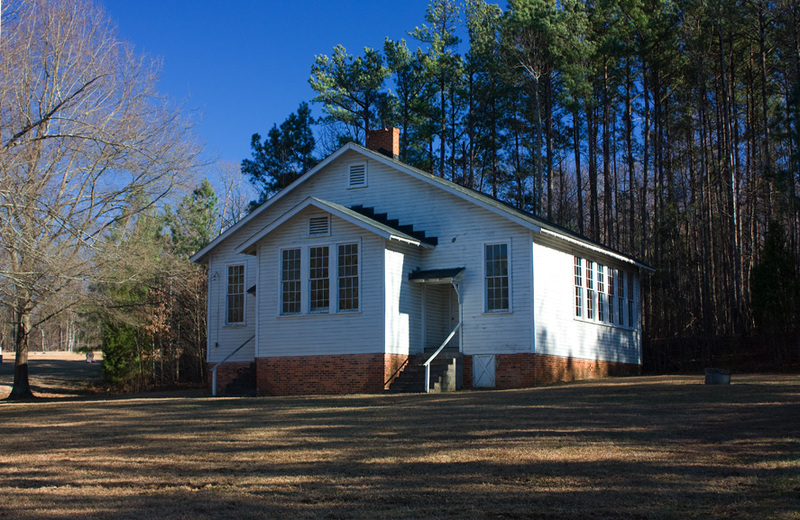 In 1945, the last year of World War II, the Durham County Board of Education sold Russell School to the trustees of neighboring Cain’s Chapel Church for “$100 and other good and valuable considerations,” after transferring its students to nearby schools, including the consolidated Little River School, a large brick school, and Mill Grove School. Thus the period of significance for Russell School ends when it ceased to operate as a school. Community leaders John Mack and James L. Moffitt coordinated fund raising activities to keep the school functioning as a community center. In a 1946 photograph of the school, a large sign in the front yard proclaims the building as “Russell’s Community Center.” Among the neighborhood activities at the school were 4-H Club meetings and Valentines Day parties. In the mid-1950s when the old frame Cain’s Chapel sanctuary was demolished and replaced with the present brick church, completed in 1956, the congregation met for worship in Russell School. Russell School has operated as a community center and as an annex to Cain’s Chapel Baptist Church since 1946. In recent years community resident Valor Holeman Mack has worked to keep the school repaired and to gain recognition of it as a landmark. She and other members of Cain’s Chapel as well as other community residents treasure their historic school and are striving to address its lack of central heating, air conditioning, and a bathroom in a way that preserves this school’s historic character. Pearl Holman, 91, was there when the Russell Rosenwald School opened. She was 6 years old then, and remembers playing with her friends on a large playground. She also remembers the two teachers for the two-room school, especially Lillie Rogers. Holman went to the school through seventh grade, then on to Little River School. Holman’s dad drove her family and two other families to school in his truck. When Russell Mack entered first grade at Russell Rosenwald School in 1940, Rogers was still teaching, still ringing the bell as she stood on the front steps and gathered the children back inside from recess. They knew not to be late. Mack lived about a mile and a half from the school and most days he walked, getting there before the teacher and waiting for her to come unlock the door. Then the older boys started a fire in the two-room schoolhouse stove and class began. Restrooms facilities were, to put it delicately, outside. Recess meant hopscotch and softball and running around in the woods. Well water came from a nearby spring. Summer months were spent farming. The students came from farming families in the rural Durham County community of Lebanon. Tobacco was the money crop, Mack said, but they also raised corn, wheat, oats and cane. Cows, pigs and chickens, too, Holman added. [The school] needs a major renovation, and Friends of Russell Rosenwald School, a nonprofit in the process of becoming a 501(c)3, has a long list of things that need to be done to make the building a landmark for future generations. The school needs painting, window restoration, electric wiring brought up to code, installation of heating, ventilation and air, bathrooms, updated plumbing and safety improvements. The roots of the school and the church cross often, and many church members and alumni are connected by their family tree. Friends of Russell chairperson Ernest Lunsford, who went to Little River School, said his memories of the Russell School are the church’s homecoming celebrations that included a big barrel of lemonade. He recalls everyone’s parents raising everybody. Doris Dunnegan, vice chair of the Friends of Russell committee and a member of Cain’s Chapel, said it indeed took a village to raise children then. Russell Mack remembers Dunnegan’s family well. There were tracks in the woods between homes, which he traveled often, going to get a mule from Dunnegan’s house, bringing it back to his house so his dad could use the plow, then taking the mule back again. “A lot of us are still on family land because the roots are so deep,” Dunnegan said. Northern Durham County is still rural – compared to the city anyway – but those woods are less forest than buffer to the next neighborhood. Still, there’s room to breathe out on St. Mary’s Road – the Durham County side, though the school and church’s address is Hillsborough. Several alumni of Russell Rosenwald and Little River schools still live in the area. Valor Mack, who started Friends of Russell with Dunnegan, grew up in Bahama and has been in the community for 38 years. “It’s been very safe, quiet, calm, private. You can sit out on the porch and not be bothered,” she said, except maybe by deer and squirrels. Restoring the Russell school is important on multiple levels. “It’s where we started our education. It’s a historical spot,” Russell Mack said. Gerald Coleman joined the church in the last few months. From New York, he knew someone who attended a Rosenwald school and when he came down to the Piedmont, was interested in the church’s connection to the school. “I think it’s something that definitely needs to be preserved and refurbished and a standing monument to education and successful alumni,” Coleman said. Valor Mack said they’re hoping to connect with DPS and give students tours of the school so they can learn about their heritage, two-room schoolhouses and a landmark of African-American education. “This is a living legacy – they can put their hands on it,” said Cain’s Chapel associate minister Cynthia Long.